14th August is a day when Pakistan came into existence on the map of the world. This day is celebrated by the Pakistani nation in a respectful manner. Every resident of Pakistan seems excited about the Independence Day celebration and they start making preparation way before 14th August. As you all know 14th August is just around the corner and many popular clothing brands are offering Independence Day Sale on their entire clothing range. Along with clothing, accessories are also necessary like bangles, smart watches and more to go with your new clothes. In this blog, I will be discussing the popular clothing brands who are offering Independence Day Sale on ladies dresses, formal dresses, party dresses and much more for their valued consumers. J. Junaid Jamshed is a popular clothing brand in Pakistan, which is offering Independence Day Sale this year. They are offering a flat 25% off on their entire clothes collection from 9th-14th August 2018 for the convenience of their valued consumers. Just like J. Junaid Jamshed, Almirah is also a popular clothing brand, which is offering flat 25% and flat 47% off on selected items in their Independence Day Sale this year. The Independence Day Sale on Almirah is starting from 9th-14th August 2018. Alkaram is a well-known clothing brand for both ladies and gents. Just like every year, they are offering up to 50% off on their entire clothing collection in their Independence Day Sale. The Independence Day Sale on Alkaram is going to start from 10th-14th August 2018. Just like every year Engine is going to offer flat 50% off on their entire collection in their Independence Day Sale 2018. The Independence Day Sale on Engine will be from 10th-14th August 2018. Levis a recognized clothing brand is offering up to 70% discount on their Azaadi Sale. The Azaadi Sale on Levis is valid on stores as well as online on Daraz.pk. The Azaadi Sale is starting from 5th-14th August 2018. Nishat is a well-recognized clothing brand among ladies and gents across Pakistan. Just like every year, they are offering up to 70% discount on their entire collection on this Independence Day. The Independence Day Sale on Nishat will be starting from 1st-15th August 2018. Charcoal a well-known clothing brand is offering 50-20% off on their Azaadi Sale 2018 for the convenience of their valued customers across the country. The Azaadi Sale on Charcoal will be starting from 10th-14th August 2018. Warda a popular ladies clothing brand is going to offer flat 30% off on their SS18 volume 1-3 both on stitched and unstitched collection from 9th- 14th August 2018. Sana Safinaz a recognized ladies clothing brand is going to offer up to 40% discount in their Independence Day Sale 2018. The Independence Day Sale on Sana Safinaz will be starting from 10th-14th August 2018. Artimmix is a rising clothing brand in Pakistan. It will be offering up to 50% discount on their collection in their Independence Day Sale from 9th-14th August 2018. 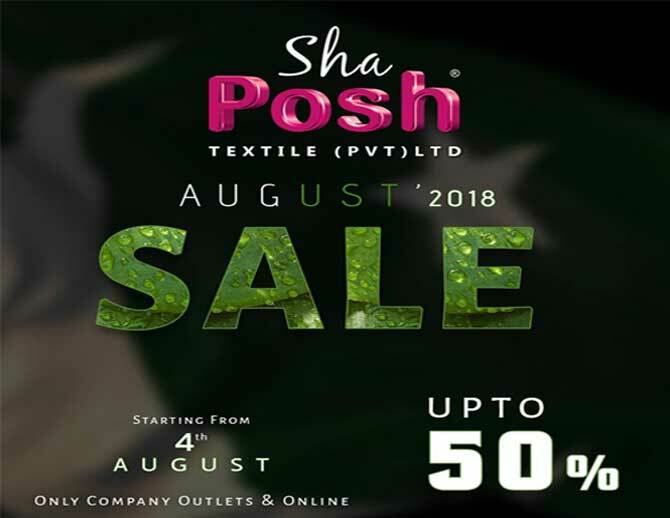 Shah Posh a well-known clothing brand is offering up to 50% discount on selected collection in their Independence Day Sale from 4th-14th August 2018.